The most useless word in dog training! Please check out my latest publication at 4Knines on the most useless word in dog training! Click below to read the full article. It's a common problem when you get a new puppy. How do you stop them peeing & pooping everywhere?? It can seem like every five minutes your pup is having a little accident. This is where good management, cleaning & lots of praise can transform your toilet training. Once your puppy has had something to eat after about 20-30 minutes take them outside or to the puppy pad & wait for the inevitable to happen. Give lots of excited praise when your puppy toilets in the right place so that your puppy begins to learn where to do their business. Even if your puppy hasn't eaten recently take them to the toilet area regularly and remember praise praise praise when they get it right. If your puppy has an accident don't punish them: This creates puppies who only learn not to toilet when you are watching them. The second you stop watching them they have to go! Punishing your puppy doesn't tell them where they should toilet so it is not very useful. Young puppies only have small bladders so don't expect your puppy to be able to hold it for long periods particularly overnight to begin with. Puppies will often also have a little wee when excited but do eventually grow out of this. A dog's sense of smell is far superior to ours. Using a regular household cleaner does not break down the enzymes in dog urine and faeces. This can lead to some dogs returning to favoured areas within your home simply because they still smell like a toilet area. Use bleach or an enzymatic cleaner to help break this cycle. BestBehaviour brings you an exciting new venture.......Puppy School Solihull! As part of BestBehaviour Puppy School Solihull will provide high quality puppy classes for puppy's up to 20 weeks of age. This is a fantastic 6 week course designed by Puppy School (www.puppyschool.co.uk). There are many varied circumstances and different motivations that lead to the development of aggression in dogs. Two of the most common motivations for aggressive behaviour are fear and frustration. When a dog is highly motivated to do something but is stopped from doing it, this can cause aggression through frustration. Similarly to young children, dogs need to build up a tolerance to frustration. This includes learning to control their impulses. For example learning ‘I can’t always have what I want the second I want it’. This takes time to establish and is often something many dogs have never been taught before. A common example of frustration is the normally calm dog that enjoys interacting with other dogs in the park when off lead. Yet when the dog is walked on lead they strain at the end of the lead and bark continuously at other dogs. The dog wants to meet up with other dogs rather than attack them but can not control their frustration at not being able to reach the other dog. Too often frustrated dogs are labelled as ‘aggressive’ or ‘disobedient’ and subsequently punished for their behaviour. In this case this could cause a conflict of emotion between the excitementof seeing other dogs and the fear of being punished. This type of emotional conflict can result in aggressive, unusual and undesirable behaviours. The use of punishment around other dogs may also cause the dog to become fearful of other dogs. This is because the sight of other dogs begins to predict punishment from the owner. It is also not recommeded that a dog in a highly fustrated state on lead is allowed to approach other dogs as this can upset other dogs and lead to fighting. Instead working on impulse control and calm behaviours around other dogs is required. For this type of training see your local trainer or behaviourist. Aggression initiated by fear is caused by the dog feeling the need to defend itself. 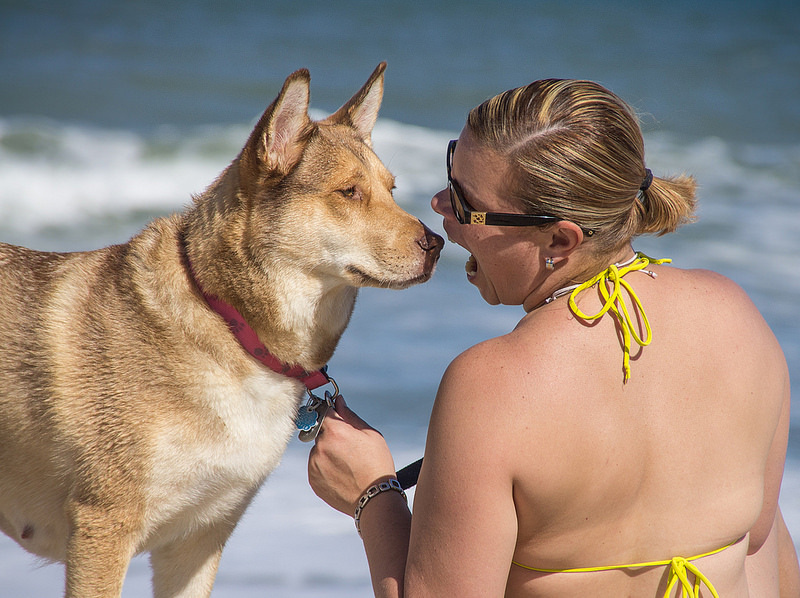 Although dogs have adapted to live with humans some human-dog interactions remain unwelcome. This includes the way in which many of us initiate contact with dogs such as hugging dogs around the neck and patting them on the head (particularly around the eyes, nose and mouth). Think about how you would feel if upon meeting you someone began putting their fingers near your eyes or grabbed you around the neck, it would probably make you feel rather uneasy! Although you may be thinking ‘I do that with my dog and it’s never been a problem’ very often the subtle signs of discomfort are there. Watch out for lip licking, blinking, yawning and turning their head away. As a rule dogs may also feel threatened if they are chased after, cornered or physically restrained particularly when trying to avoid something they are unsure of. It may be that your dog can tolerate many of these interactions however there is also an effect known as trigger stacking. This is when several triggers occur and eventually it all becomes too much for the dog to cope with. A human example of this would be 'reaching the end of your tether'. For example your dog may cope with the children chasing him, poking him and pulling his tail but when one of the children then goes to hug the dog it is all suddenly too much to cope with and a bite occurs. Think of it as the final straw during a stressful day! This build up of stressors is likely the cause of many bites within the home that to owners often appear out of the blue (the dog previously coped with the triggers when they occurred one at a time) and without warning (they didn’t know the warning signs). Ultimately the majority of bites are predictable and can be avoided through sesnsible managment and training. Punishment can be a significant cause of fear and anxiety in a dog’s environment. the use of punishment is counterproductive doesn't actuall teach a dog what they need to do. The use of a stern ‘no’ is generally confusing for dogs because the word has no real meaning i.e. does it mean stand still? Sit? Move away? Or something else? and is used in such a wide variety of situations. Therefore the use of punishment often leads to confusion, increasing anxiety and makes an aggressive response all the more likely. For example, in a dog that is punished when they do not give up a toy the dog learns to avoid punishment by avoiding the owner when they have a toy. The dog then runs away from the owner with the toy. This avoidance leads to further punishment increasing the dog’s anxiety and eventually contributing to aggressive guarding behaviours around toys. This scenario can easily be avoided by teaching the dog to give up the toy to get a reward and by returning the toy afterwards. The dog learns that giving something up is beneficial and does not always mean they won’t get it back. There are many potential causes of aggression only a few examples of which have been covered in this article. If you are struggling with dog aggression it is always best to consult a professional for the safety of yourself, your dog and others. Due to extensive media coverage whenever there is a serious dog attack we are all aware of what can go wrong when dogs act aggressively. Yet many owners still believe that their own dogs would never behave in this way. It is a common assumption that dogs involved in human attacks must be untrained, abused or a “dangerous breed”. However, with dog attacks rising year upon year in the UK and more attacks appearing to occur within the home, it is becoming apparent that this is simply not the case. But what is Aggression? Before we can manage aggression we first need to understand what aggression is. Although aggression is difficult to define we know that aggressive behaviours are actually normal behaviours displayed by most animals throughout their lifetime. Aggression helps animals to survive by fending off threats and protecting valuable resources such as food, water and shelter. Aggression may also occur during periods of frustration or if an animal has learned acting aggressively gets them something that they want (i.e. it has been reinforced). Often the aggression we see in dogs is normal given the circumstances. If a dog were to try and steal another dog’s food a normal response from the dog with the food would be to protect their food to avoid starving. Many dogs will allow other dogs and people to take their food, however, if you try to take a food bowl away from a dog mid-meal you should expect that they could react aggressively. This is a normal and predictable response to an obvious threat. Understanding situations like these and not automatically treating aggression as abnormal, disobedient or unpredictable allows the risk of aggression in dogs to be managed much more effectively. In addition it is worth remembering that animals tend only to use aggression involving physical contact as a last resort after first using many other warnings and signs of discomfort. A useful model used to understand how aggression can escalate in dogs is the ‘ladder of aggression’. Although by no means applicable to every dog, this model describes a general sequence of behaviour that typically precedes a dog bite, particularly in situations where a dog is fearful. Most dogs will signal initial discomfort through subtle behaviours such as licking the lips and nose, yawning, blinking and turning their head away. These behaviours are used by dogs to signal to other dogs ‘I’m uncomfortable with this’ but as humans we tend to miss these signals. If a situation remains unresolved the dog may progress further up the ‘ladder’ until, as a last resort, an actual bite occurs. There are cases where progression up the ladder can happen extremely quickly, particularly in situations where a dog is excessively fearful. Managing these situations involves careful behaviour training as well as avoidance of all similar situations until the issue has been fully resolved. In other cases steps on the ladder can become missed out completely. Often this can be due to previous punishment for these behaviours leading to the behaviour being suppressed. For example the dog that has been punished for growling subsequently will not growl before biting. In this way punishing dogs that growl can take away the last warning that a dog is about to bite. The use of punishment to try and reduce aggression is therefore potentially highly dangerous. In addition to taking away warning signals at times when the motivation behind the initial aggressive behaviour (e.g. fear, frustration or pain) subsequently outweighs the fear of the punishment the aggressive behaviour is likely to reoccur. Worse still the dog is likely to progress further up the ladder to try and resolve the situation. Instead to effectively resolve aggression issues the underlying motivation for the behaviour in the first place must be addressed. Exciting news! BestBehaviour has been invited to create learning resources for the world veterinary association's new education portal (http://www.worldvet.org/). This is going to be a fantastic resource accessible those in the veterinary profession all over the world. I will keep you posted as to when we have materials up and running on the site. We have moved! Finally! We are now in our new home but the delay has meant we are a bit behind schedule. At the moment we are just settling in & getting some work done on the property. Hopefully we will be up and running in the near future. Dogs generally do not enjoy overly friendly attention such as hugging. Everywhere I go I see people, more often than not children, hugging dogs! Some dogs may seek out attention wishing to snuggle up with their owners on the sofa etc.. and this is absolutely fine, however many dogs do not enjoy hugging! (I am talking about the type of hugging where a person's arms are linked around the neck or body of the dog.) It may appear like a caring comforting gesture to us but it is not something dogs would normally experience within the dog world. If you look for the signs on the ladder of aggression (see staying safe part 2) you will see many dogs licking their lips, yawning, blinking and turning their heads away when they are being hugged. These are the first signals a dog performs in any given situation to communicate that they are feeling uncomfortable. The type of physical restraint caused by hugging a dog around their neck or body will cause some fearful dogs to react very quickly and aggressively in order to free themselves straight away. It is therefore particularly unwise to hug a dog that is not your own or to let a child hug a dog. In these situations the child’s head is often close to the mouth of the dog (particularly in the case of children of toddler age) putting them at risk of a serious bite to this vulnerable area should something go wrong. You may well say "but my kids do this with my dog all the time and he is fine with it!". It may be that your dog tolerates the interaction however it is unlikely that they particularly enjoy it. Imagine you dog is having a bad day, perhaps your dog has had to cope with a lot of strangers in the house, has been bothered by the dog next door or been chased round the garden all afternoon by your noisy nephew. There may be a point at which your dog feels they have reached their limit with what they can cope with on that day, they have reached what you or I might call 'breaking point' or what we as behaviourists call the dog's 'threshold'. When your child then goes to hug the dog it is suddenly all to much and they snap. To owners the attack appears out of character and totally unpredictable however these type of attacks are avoidable. I always advise that hugging interactions are avoided between children and dogs 100% of the time. There are plenty of other fun ways your child can interact with their dog and it is simply just not worth the risk of a bite to your child. Putting dogs into a situation where we know they are uncomfortable is always ill advised. The dog is not misbehaving when they react with aggression in this way they are actually behaving normally, the same way as you or I might behave if we felt threatened. There are very very few truly aggressive dogs and it is time we started recognising that aggression is a normal behaviour in dogs and we should expect aggression to occur in any dog including our own if they feel threatened. Risky Interactions with dogs. Note the proximity of the child's head to the dog's head in the image on the left and again the proximity of the woman's face to the dog's mouth in the image on the right.